Coco Gardening is a method of growing plants using coco coir a growing medium. Coco is known well as coco coir. It is a fiber made of coconut husk which is surrounded on coconut shell. Coco coir is also known as coco peat, coco coir, growing medium or simply coir. Coco coir is made out of millions little micro-sponges, which can hold up to 9 times extra added water and 1000 times additional oxygen. Coco gardening become more popularity in organic and hydroponic gardening due to its holding capacity of water and plant nutrients. Growers add coco in their compost to make a perfect growing medium especially in container gardening and in urban farms. Coco naturally contains pH level of 5.0 to 5.9 which is neutral to slight acidic. Coco coir is slow in releasing water and nutrients this helps the plant to develop a strong root system as well as healthy. Coco is used in various fields such as potting mix, green houses, hydroponic growers, seedling nurseries, lawn constructors, horticulture and is small indoor and outdoor home gardening. Though Coco gardening has lot of advantages it also have some disadvantages. Basically coco coir contain large quantity of salt which can harm your plant growth. 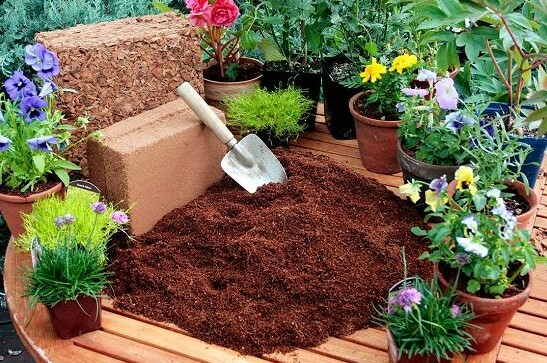 Before using you need to cleanse them properly and make sure you use a good quality and pre rinsed coco coir in your garden. Ensure to break coco coir once you wash them, this will help the plant to receive oxygen without any blockage. Many hydroponic companies manufacture plant nutrients suitable for all types of growing medium like rockwool, perlite, clay pebble, hydroton etc., on other hand coco coir needs special attention in terms of plant nutrients as it not like other growing medium. Coco coir doesn’t come up with natural nutrients apart from calcium and magnesium, so to boost up your plants and to get big yields you need to provide necessary plant nutrients. Don’t use nutrients designed for other growing medium in coco coir as you will end up killing your plants. Use only coco coir safe products that are specially designed for coco gardening. Make sure your coco contain chelation magnesium and calcium to grow bigger harvest. Coco coir holds chelation magnesium and calcium to get a greater yield. The best supplement answers for coco coir may as well have some additional calcium, not excessively as it will go after potassium uptake bringing about a potential for potassium insufficiency. You can utilize the best coco coir safe items accessible in nurseries or plant supplement organizations. Coir is light weighted that holds supplements against filtering and does not psychologist throughout the plants developing cycle. Coco gardening is an excellent source for growing vegetables especially when you look for organic and healthy vegetables. Not only organic but it is also an environment friendly way to start your own garden.